In the first major policy statement under newly installed President Russell M. Nelson, the LDS Church urged Congress on Friday to act quickly to protect from deportation hundreds of thousands of “Dreamers,” whose undocumented parents brought them to the United States as children. In a news release posted on mormonewsroom.org, The Church of Jesus Christ of Latter-day Saints called on lawmakers to “provide hope and opportunities” for the estimated 1.8 million Dreamers living in the nation. Until recently, Dreamers were protected from deportation under Deferred Action for Childhood Arrivals, or DACA, which allowed them a legal pathway to attend school and work in the country. In September, President Donald Trump announced that he was rescinding the Obama-era program, which he saw as executive overreach, and shifting the responsibility for a solution to congressional leaders. Luis Garza, executive director of Comunidades Unidas, a Utah Latino advocacy group, welcomed the statement from the state’s predominant faith. Richard Jaramillo, president of the Utah Coalition of La Raza, saw the statement as a pleasant surprise, given the recently reshuffling of LDS Church leadership after the Jan. 2 death of President Thomas S. Monson. Some observers had suspected the new Mormon leadership — Nelson and his counselors Dallin H. Oaks and Henry B. Eyring — would take a more conservative stance. This new governing LDS First Presidency has been in place for less than two weeks. Bernardo Castro-Bernal, a Mormon Dreamer and former LDS missionary, was happy with his church’s stance, but wished it had come sooner. “Maybe this is a change of tone [for the church] with the new leadership,” the 26-year-old Orem telecommunications salesman said. Castro-Bernal, who served his LDS mission in St. George, said it likely would be encouraging, too, to other Mormon missionaries who are undocumented. These prospective missionaries (who must declare their immigration status before serving) are assigned only to U.S. missions and have to stay out of airports and arrive and leave by car, bus or train. Other than for its missionaries, the LDS Church takes a “don’t ask, don’t tell” approach toward the immigration status of its members and potential converts. Some estimate between 50 percent and 75 percent of Mormons in Utah’s 100-plus Spanish-speaking congregations are undocumented. That includes many of the lay leaders. According to an internal 2012 document, released by MormonLeaks, LDS leaders were told they have no obligation to ask or report an immigrant’s residency status. It further states that welfare aid should be divvied to undocumented immigrants as it is to all members as spelled out under church guidelines. Ron Mortensen, a Utah Mormon and a fellow at the Center for Immigration Studies, criticized the church’s statement. A longtime anti-illegal immigration advocate, Mortensen said studies have shown that most Dreamers held jobs before gaining DACA status. To land employment, he noted, they would have had to provide Social Security numbers. Rep. Mia Love, R-Utah and the Mormon daughter of Haitian immigrants, has been pushing for a DACA solution and cheered Friday’s statement from Mormon leaders. Her Democratic rival in this year’s 4th District race, Salt Lake County Mayor Ben McAdams, echoed that praise. The Catholic Diocese of Salt Lake City, a persistent pusher of immigrant rights, was happy to have the state’s biggest religion officially join the pro-Dreamers camp. The Utah chapter of the American Civil Liberties of Union joined the chorus of supporters. He said that, while it is true no Dreamers are currently being deported, many people don’t realize that “under the current legal limbo we are in [we are] losing the youngest of the Dreamers, those 15 years old who now cannot apply for protection from deportation. 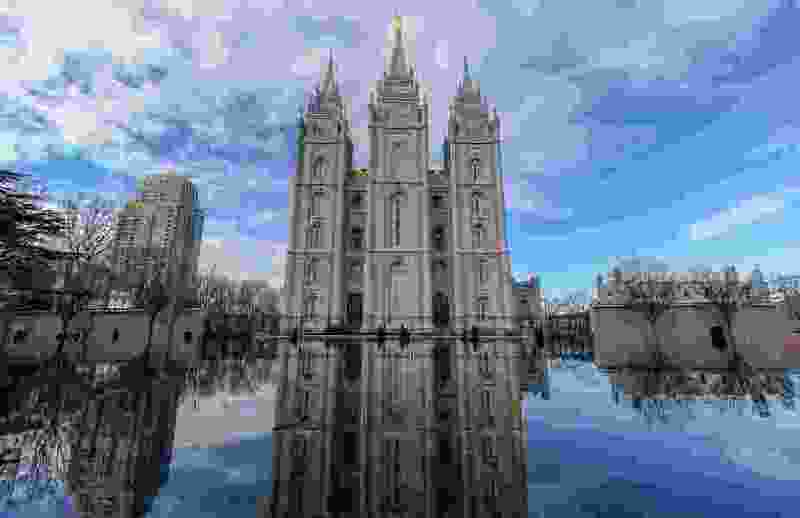 In its release, the LDS Church said that issues of immigration and legal status are “of concern for many of our members” due to Mormonism’s global presence and its history of members emigrating for religious purposes. The LDS Church has voiced its backing before for immigrants. It endorsed, but did not sign, the Utah Compact, a guiding document widely embraced by religious, business and civic leaders in the state that called for a federal solution with an eye toward compassion for undocumented immigrants. LDS apostle Dieter F. Uchtdorf, then a member of the First Presidency and himself a two-time refugee, met twice (2013 and 2014) with then-President Barack Obama in the White House, where he lauded the Utah Compact as a “pillar” in the immigration debate. The Mormon woman, who was brought to the U.S. as a child but then deported from Utah to Mexico in 2009, noted that Dreamers make up only 5 percent to 7 percent of undocumented immigrants in the United States. Reporters Peggy Fletcher Stack and Mariah Noble contributed to this report. 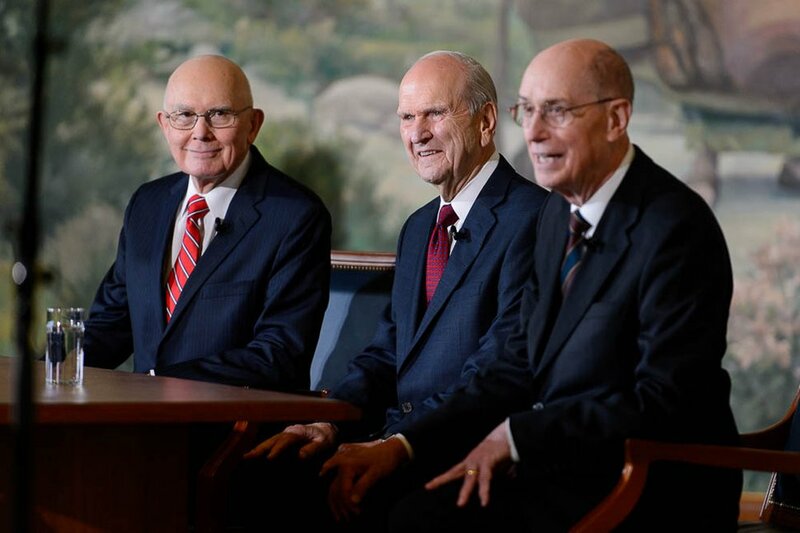 (Trent Nelson | The Salt Lake Tribune) Dallin H. Oaks, Russell M. Nelson and Henry B. Eyring at a news conference in the lobby of the Church Office Building in Salt Lake City, Tuesday, Jan. 16, 2018. Nelson was named the 17th president of the nearly 16 million-member Church of Jesus Christ of Latter-day Saints. Oaks was named first counselor in the First Presidency and Eyring second counselor.